Author Sherry Jones Shares What She's Reading! As any voracious reader knows, there are so many books out there, it can be hard to choose just what to read next. So what could be better than a hand-picked recommendation from someone in the know? Every Wednesday the XOXOAD team likes to find out what some of its favorite authors are reading; today we’ve asked Sherry Jones, author of The Sharp Hook of Love, to tell us! Before I can write one of my heroines, I have to inhabit her completely. That’s why I’m reading four biographies all at once of the famous African-American jazz dancer, singer, nudist, lover, and freedom fighter Josephine Baker, the most beloved performer in Paris and the protagonist of my next novel for Gallery Books. I’ve never read four biographies concurrently, or even two. Doing so is a revelatory experience, and convinces me more than ever that history is as subjective as fiction — because each of these books is different from the rest, and each provides a unique picture of a woman whom I am thrilled to have the privilege of knowing as intimately as I know myself for the next year. 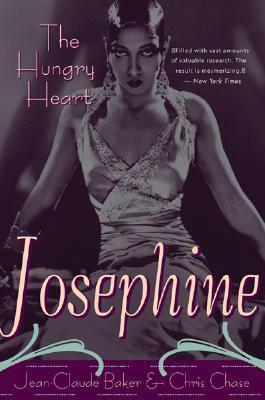 Josephine Baker: The Hungry Heart, by Jean-Claude Baker (1993), Josephine’s eldest adopted son (with writer Chris Chase), nearly frightened me away from writing about her! Adopted by Baker when he was 14, the author portrays his “second mother” (his first was still living, and impoverished, when Josephine took him under her wing) as a voraciously promiscuous, unstable attention seeker. He speaks of her with wry affection, but the woman he presents is so difficult, self-centered, and disturbed that I wasn’t sure I wanted to spend a lot of time in her skin. However, Jazz Cleopatra: Josephine Baker in Her Time (1989) by Phyllis Rose, presents a much different perspective, portraying Baker as a woman hungry for love, yes, but also one with the highest ideals for harmony among all races. In this book, La Josephine truly blossoms as a spy for the French Resistance during World War II, finding something outside herself to fight for — and she uses the courage and strength she develops to fight segregation in the United States as early as 1951, earning a medal from the Rev. Martin Luther King, Jr.
Lynn Haney’s Naked at the Feast (1981) is the most objective of the four, and also very evocative in its descriptions of life and times during Baker’s 50-year reign as the “Black Venus.” Her book provides the most detailed information on Baker’s fascinating, troubled childhood, and is as readable as a novel. But the most imaginative of the four, by far, is Baker’s autobiography, Josephine, published after her 1975 death by her ex-husband Jo Bouillon. This woman who freely re-invented herself many times — her father was a Spaniard, or a Jew, or Native American, or some combination of the above, she would tell reporters at various times, although biographers agree he was a black musician named Eddie Carson — apparently continued the trend while writing her own story. She doesn’t mention her father in this book, however; nor does she write about the two men she’d married by age 15. Still, it’s an entertaining account of her life, interspersed with interviews Bouillon conducted with family members and those who knew and worked with her, and provides insight into the workings of her fanciful, fascinating mind. For me, now, the question is, which version of Josephine Baker’s fascinating life do I believe? As with my previous books, I’ll most likely incorporate bits and pieces of them all, according to the vision I develop of this extraordinary woman with perhaps the greatest rags-to-riches story of all time. Based on twenty years of research and thousands of interviews, this authoritative biography of performer Josephine Baker (1906-1975) provides a candid look at her tempestuous life. Josephine Baker's fascinating life encompassed stardom in the Paris of the 1920s, a career in the French Resistance, and civil rights activism in the '50s and '60s. Rose brings Baker to life as a performer, as a cultural icon, and as a black woman in a white world. Josephine Baker was the very essence of Paris in the riotous twenties. Hemingway danced cheek to cheek with her, proclaiming her to be the most sensational woman anyone had ever seen; Picasso painted her; Colette sent her fan letters; her name was linked with Mussolini, de Gaule, Peron, castro, Tito and the Pasha of Marrakesh. This is the story of a remarkable woman in a remarkable era.